Sugar, also called sucrose, is everywhere -- in obvious places such as pastries and your morning cup of coffee and hidden in plain sight in condiments and processed foods. If you are trying to avoid white sugar for any reason, there are alternatives from which to choose. 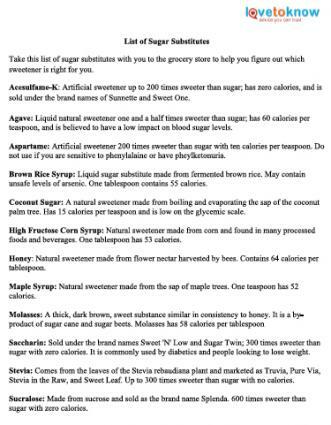 Following is a list of sugar substitutes to help you make sense of what's available. Sugar substitutes are made of either natural or chemical ingredients. Some are considered a healthier alternative to sucrose while others offer sweetness with few calories. Download a printable version of this list by clicking on the image to the right. If you need help downloading the printable, check out these helpful tips. Marketed under the brand names of Sunnette and Sweet One, acesulfame-K is an artificial sweetener often found in sodas, syrups, and chewing gum. It is often used in conjunction with aspartame or other artificial sweeteners. According to Elmhurst College, acesulfame-K was discovered in 1967 and is 150 to 200 times sweeter than sugar. It has a chemical structure similar to saccharin and is highly stable. Acesulfame-K has zero calories and is not metabolized by the body. It was approved for use by the Food and Drug Administration (FDA) in 1988 and currently has no warning labels. Agave is a natural sweetener derived from the agave plant, most often blue agave. It is one and a half times sweeter than sugar and has about 60 calories per teaspoon, says WebMD on its website. Agave is marketed as a low-glycemic sweetener that does not raise blood sugar levels as drastically as cane sugar, high fructose corn syrup, or other sweeteners, yet studies on agave remain mixed. Agave side effects include allergic reaction and gastrointestinal problems. And all agave is not created equal, indicates the Global Healing Center. Much of the agave found on supermarket shelves, even some organic varieties, has been highly processed and stripped of nutrients. For this reason, investigate available agave brands before using and choose one that is minimally processed without chemicals. Aspartame is an artificial sweetener found under the brand names of NutraSweet and Equal. It is created by combining two amino acids -- phenylalanine and aspartic acid. It is about 200 times sweeter than sugar and found in a large variety of processed foods such as baked goods, beverages, candy and chewing gum, yogurt, snack foods, and condiments. The FDA has approved aspartame for use at 50 mg per kg of body weight. According to the American Cancer Society (ACS), aspartame is safe when used within the FDA's guidelines. If you are sensitive to phenylalanine or have phenylketonuria, you should avoid aspartame. A liquid sugar substitute, brown rice syrup is derived from fermented brown rice. It is sweet and similar in consistency to honey and molasses but has a distinctively different taste. The syrup can be used as a substitute for cane sugar in baking or flavoring tea. It is also found in powdered baby formula, snack foods and baked goods. According to Fitbit, two tablespoons of brown rice syrup has 110 calories and 31 grams of carbohydrates. Although brown rice syrup has no known side effects, it may not be the safest sweetener choice. An ABC News article written by Jane E. Allen indicates that researchers determined organic brown rice syrup "may introduce significant concentrations of arsenic to an individual's diet," and that there is "an urgent need for regulatory limits on arsenic in food." Coconut sugar is made from boiling and evaporating the sap of the coconut palm tree. It has about 15 calories per teaspoon, is low on the glycemic scale; however, the American Diabetes Association cautions that glycemic scale numbers vary depending on the product source, and in the United States there is no official testing for glycemic scale values. As a result, they advise diabetics to treat coconut sugar the same as table sugar. High fructose corn syrup is made from corn and because it is inexpensive, it is found in a huge variety of processed food products, from sodas and baked goods to yogurt and vitamins. Whether or not the sweetener is healthy is controversial, but Jennifer Nelson, R.D., L.D. states on the Mayo Clinic's website that there is "insufficient evidence to say if high fructose corn syrup is any less healthy than other sweeteners." One tablespoon of high fructose corn syrup has 53 calories. Honey is known as one of nature's superfoods due to its nutrition content and healing properties. Honey is a natural sugar substitute made from the nectar of flowers harvested and processed by bees. The variety depends on the flower used to harvest the nectar. Common varieties include clover, orange blossom, wildflower, and thistle. Honey has 64 calories per tablespoon. It has no known side effects and local, raw honey may help people with seasonal allergies. Honey may be a sugar substitute in baked goods, added to tea and other beverages, or used in marinades, dressings, and condiments. When purchasing honey, choose organic brands for the best nutritional value. Maple syrup is a natural product known for being sweet and nutritious. It is made from the sap of maple trees, most commonly the sugar, red, or black maple varieties. One tablespoon of maple syrup has 52 calories. University of Rhode Island researchers found an abundance of healthy compounds in maple syrup. These include several antioxidants believed to have anti-cancer, anti-bacterial, and anti-diabetic properties. Molasses is a thick, dark brown, sweet substance similar in consistency to honey. It is a by-product of sugar cane and sugar beets and used as a sweetener in baked goods such as gingerbread and pies, or drizzled over oatmeal. Molasses has 58 calories per tablespoon. It is a good source of calcium, iron, manganese, and copper. Sold under the brand names Sweet 'N' Low and Sugar Twin, saccharin is a noncaloric chemical sweetener that is up to 300 times sweeter than sugar. It is commonly used by diabetics and people looking to lose weight. It is also found in many sugar-free and low fat processed foods. According to Elmhurst College's website, saccharin is one of the most studied artificial sweeteners on the market and that more than 30 human studies support its safety. Stevia, also known as Reb A, comes from the leaves of the Stevia rebaudiana plant and is marketed under several brand names including Truvia, Pure Via, Stevia in the Raw, and Sweet Leaf. Stevia is up to 300 times sweeter than sugar but is believed safe for diabetics since it does not raise blood sugar levels. Many people do not like the aftertaste of Stevia. Stevia has no calories and has been approved by the FDA as a food additive and labeled "generally considered safe." However, according to Katherine Zeratsky, R.D., L.D. On the Mayo Clinic's website, "the FDA has not approved whole-leaf stevia or crude stevia extracts as food additives because of concerns about potential health effects." Sucralose is made from sucrose and sold as the brand name Splenda. It was discovered in 1879 and is 600 times sweeter than sugar. It can be used in baking or as a beverage sweetener. Splenda's safety is controversial. It is FDA approved; however, some studies report it may trigger migraines. Most sugar substitutes are safe to use and cause few, if any, side effects. However, as with any ingredient, moderation is key. Consuming too much of a natural sweetener adds extra calories and may lead to insulin spikes. High levels of artificial sweeteners may increase your risk of developing side effects. 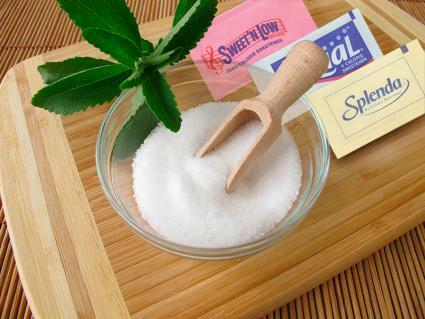 Decide which sugar substitute is best for you based on taste and other factors.